It’s been known in recent years that a colony of Least Terns (Sterna antillarum) had become established in the Horseneck Beach dune system. The terns had formed a sizable colony in the rocky east refuge, had a few small nests in areas already protecting Piping Plover (Charadrius melodus) on the main beach, and last season found their way to the west dune system where a small colony formed. Most recently a robust sub-colony had formed in the new restoration areas near the headquarters which provide exceptional tern habitat – the young simply wait for a seafood delivery and need not cross roads to the waterfront. The colony basically surrounded the main public beach, which in its pristine state is exceptional natural habitat for the shorebirds. Depending upon the confluence of certain factors, it was only a matter of time before they claimed the public beach before crowds arrived. This year, it happened. During May when the terns were seeking out habitat, cool rainy weather prevented sustained crowds from visiting, leaving the entire beach there for the taking. Mechanical raking was delayed which left the beach undisturbed. The lower berm of the public beach had become increasingly rocky since last winter, but behind that was a vast lightly cobbled berm mixed with vegetation which attracts the shorebirds. The near absence of habitat in the rocky east refuge and increasingly eroded shoreline at the town beach further down means the public beach has the best habitat on the entire Westport barrier beach system. Approximately 15 pairs of terns nested on the public beach, a tiny count by tern colony standards, but Least Terns are a state-listed species, so their nests require protection. While the feisty terns don’t need quite the amount of fencing provided to plovers, each nest requires a buffer. Nests appeared randomly across most of the beach while the plovers were also quietly at work. A total of six pairs had distinct territories, the highest count ever on the main beach. As many as 15 pairs (not including any re-nests) of plovers nested on the reservation, a new record. Horseneck was in virtual shorebird lock down. Due to this ‘beach takeover’, a special permit was granted by the Natural Heritage and Endangered Species Program (NHESP), allowing fence reduction around tern nests to prevent trampling and provide some measure of protection, and miraculously none abandoned! They have tolerated the crowds thus far and new chicks are emerging daily. 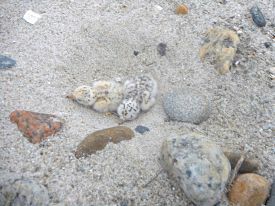 For Piping Plovers, the usual high density of nests (6) again appeared, many hatchlings on the move and more on the way. 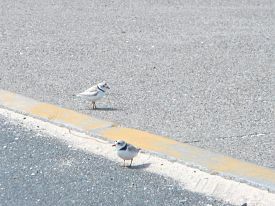 On the main beach, one nest hatched and another is on the way, while three have hatched from the restoration area resulting in closure of the main connecting road between the two lots. 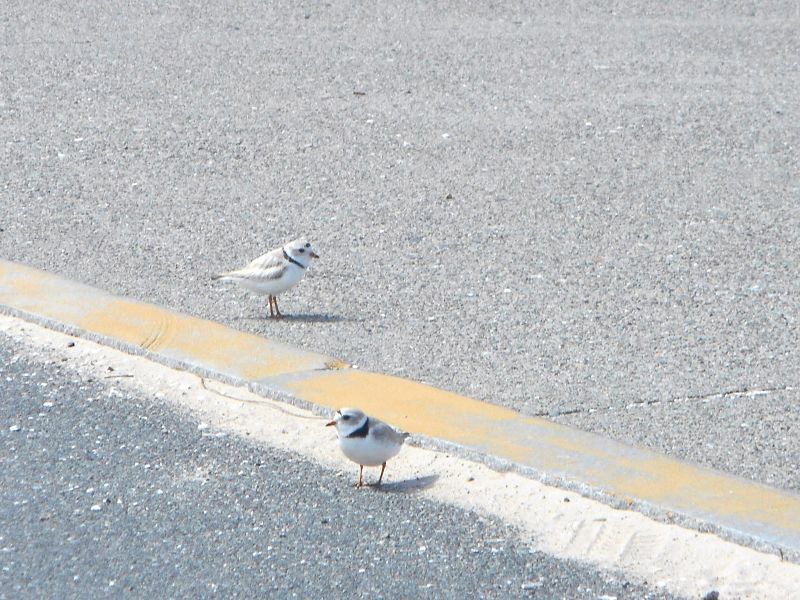 While this certainly created more work for all involved with constantly escorting vehicles needing to use the road, this is helping keep the one to two plover chicks roaming the pavement from being hit in similar fashion to the “take” that occurred last year. Considerable nest loss for plovers has occurred with predators taking five nests, all but one from the main beach where the tern colony surely attracted the attention of predators such as coyote, skunk, and Great Horned Owl, the latter which may have taken an adult tern. Coyotes predated a considerable number of tern nests, a few plover nests, and likely caused mortality of one adult plover. On Demarest Lloyd State Park, considerable nest loss has also occurred with three over-washes and two predated nests (again coyote is to blame), and one brood vanished quickly, likely due to Great Horned Owl. Nests are close to hatching and a pair just started its 3rd attempt, so we’re still hopeful for some success there, including from a Least Tern colony that is hanging on at the far tip. At West Island, modest nest lost including two predated nests and one over-wash occurred, but one nest is soon to hatch and two broods are going strong. This is fortunate since all nesting has occurred on town property, where efforts are reduced this season. A recent nest at nearby Winsegansett Heights in Fairhaven was lost to over-wash as well, so nest loss from high moon tides in some cases coinciding with rainstorms has been a considerable force this season. Tune in late summer for the wrap-up, when we’re sure there will be much good news to report following a challenging season!